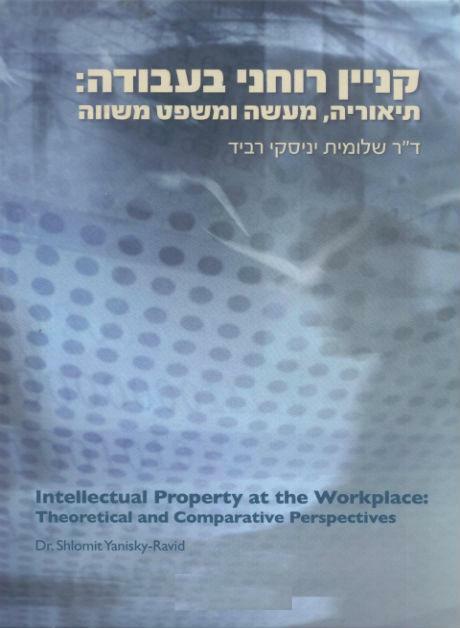 My peer-reviewed book review of Intellectual Property at the Workplace: Theoretical and Comparative Perspectives by Dr Shlomit Yanisky-Ravid has now published in the Journal of Intellectual Property Law and Practice. In the review I have tried to give a fair and comprehensive overview of the contents and of the author’s prescription for improving the system. I then have commented somewhat extensively on her thesis. As I have discovered over the years since I studied Labour Law under Shlomit, I have a very different philosophy of life and political orientation than she does. Nevertheless, I note that she is motivated by Tickun Olam and is trying to right what she sees as wrong. I applaud this. Although I disagree with most of her conclusions, I consider the book an enjoyable and thought provoking read and a worthwhile addition to any Israeli practitioner’s bookshelf. The paper can be found in text form here and as a PDF in the format it will shortly appear in the Journal here. I am reproducing the report (with permission in full below. I am interested in any comments from readers and am sure Dr Shlomit Yanisky-Ravid will be as well. The book explains the current state of IP law in Israel with respect to employer–employee rights, and compares it primarily to other regimes that use the Anglo-American common law system, but also to the Continental civil law systems as practised in Germany and France. the wealth distribution model (Rawls). The book analyses the fact that employee-invented patents are owned by the employer, and not the employee. The author reasons that patents for inventions should be owned by the employee as the one who labours and whose personhood is reflected in the invention, since this leads to a more equitable distribution of wealth. Thus all the models, apart from the law and economics approach, lead to the conclusion that the employee should own the rights to a patent on an invention based on his labour. The author sees the employer–employee relationship as stacked against the employee. She eloquently makes a case for changing the law through legislation, but also attempts to show how the law, as currently formulated, could be creatively interpreted to assign rights to the employee. She would like cogent legislation to prevent employees signing away their rights to future IP they create. Such assignments should only be made after creation. Companies are expected to be compensated for their investment. There is an interesting chapter on women inventors, or rather their scarcity, and the underlying causes. This is not totally tangential to the discussion, since it indicates a similar flaw in the current legal system and the resultant division of ownership. The author posits that, as with IP law, the inherent bias causes an inequitable division of resources that further entrenches inequalities. She notes that over the five-year period from 2000 to 2005, only 1.9 per cent of patentees receiving Israel patents were women, 30 per cent were men and the rest were companies. With regard to employee inventions, 13 per cent of named inventors were women and 87 per cent were men. This is understood to imply that women more often invent as part of teams, but are rarely at the narrow apex of the pyramid. The author cheerfully notes that her analysis does not directly prove the source of the discrimination. Nevertheless, a feminist approach to IP rights is presented, the book purporting to address the legal and other structures that exclude women from owning IP rights. The author considers that property rights per se have been under-analysed from a gender perspective, and that the traditional patriarchal society has defined property in a way that favours men. The situation in IP rights, in general, and patents in particular, is seen as an extreme example of this built-in discrimination. Citing McKinnon (Catharine A. MacKinnon, Feminism Unmodified, Discourses on Life and Law, 1987 and Towards a Femist theory of the State, 1989), Gilligan (K. Gilligan, In a different voice, the theory, psychology and development of the woman, Hebrew Translation, 1995) and Fisk (Catherine L. Fisk, Removing the ‘Fuel of Interest’ from the ‘Fire of Genius’: Law and the Employee-Inventor, 1830–1930 65 University of Chicago Law Review 1127 (1998)), the author reaches the radical conclusion that the fact that women are not often named as inventors is proof that the legal system, the definition of patentable subject matter and the concept of ownership inherent in the concept of intellectual property as property all discriminate against women. The biases in patent law that result in this discrimination are not apparent, but they would not be expected to be discernible since they are so deeply entrenched. Bias is not, however, purely a masculine aspect of IP law. Other sectors of society are under-represented amongst inventors and owners of intellectual property and these similarly show that the system is biased. Affirmative action is proposed. Specifically, there should be a minimum quota of female examiners in the Israel Patent Office and in government entities. Forcing commercial companies to employ women in R&D is also suggested, but not stressed. The author toys with the idea of widening the definition of inventor to include research assistants, lab workers and junior staff. The book notes that academics own the copyright in their papers and books, despite being employed by universities, and also notes that university inventors are often awarded 30–50 per cent of the royalties: universities seem to thrive under this relationship. This is seen as a model to be emulated by the medical and industrial sectors. Returning to general service inventions, the author proposes that the names of employee-inventors of service inventions should be disclosed by law and that this should be done immediately. Their moral right to be named should be cogent. Other moral rights may be weaker. She suggests that where employees assign their rights to companies, it should be ex ante, and that clauses in service contracts that call for assigning any and all future inventions to the company should be illegal. Apart from cases where employees are employed to invent or where a company has invested capital, employees should be under no obligation to assign their rights. Where they do, they are entitled to proper compensation, thereby increasing the size of the cake. The standard tests of who is an employer and who is to be considered an employee, as far as service inventions is concerned, should take into account the developments in labour law but it will be noted that, in labour law, these provide rights to the employee, whereas in IP law these take rights away. The author promotes a model that attempts to find a golden mean among the different theoretical models justifying IP, noting that the current model is almost exclusively economy-based, apart from some moral rights in continental countries. In her view, the first owner should always be the inventor or creator. The right to be acknowledged as such is cogent and cannot be waived. Where a work product is assigned to the company, the name of the employee inventor must remain a matter of record. The consideration for so doing is only to be negotiated at the time that an invention is transferred to the employer, and may even be subsequently negotiated if conditions change. The consideration is to be a percentage royalty minus costs, similar to that adopted by academia (except Germany). The reason why such a model is not adopted anywhere is that IP laws are always uni-dimensional, being based on a single model, the economic one. In Israel, there has been no deep conversation on the subject, and the current model is uni-dimensional, reflecting economic considerations only. The model suggests new legislation, and in the meantime, creative interpretation, to address this issue. The author argues that the current Israel law can be interpreted as indicating that any medical invention by a medical doctor is owned by the employer. She argues that medical doctors, excluding lab workers, for example, are not employed to invent, but rather to heal. According to the model, their inventions are not generally connected to the hospital or health fund, and the doctor should be able to develop his or her idea independently and not be under obligation to assign it to his or her employer. Similarly, technicians and other employees of hi-tech firms, excluding R&D personnel, are not employed to invent, and any inventions should be theirs to license or assign to the company only if sufficiently compensated for doing so. The author then lists the principle of her model for interpreting the current Israeli law, and preferably for amending it through legislation. Not to be accused of unjust modesty, she further proposes that it be used as the basis for a new international convention to regulate the field. Employee creations and inventions are the employees’. Any assignment to the employer will be ex ante and case-specific, and not in an employment contract apart from exceptional cases where part of the job description is to invent or create. There will be no obligation to assign where: (a) the employer’s contribution is not significant, such as where the use of the employer’s resources is incidental; (b) the employee’s contribution to the product is significant; or (c) the creation is worthless. The guiding principle is that the employee’s inventions will belong to the employee. Assignments to the employer are to be made only after the product is developed and where the employer has a genuine interest due to having initiated the product, supervised it, invested in it, contributed to it and used the employer’s own resources. The assignment will be in accordance with cogent law and in writing. If non-economic considerations (theory of person, product of labour and wealth distribution) outweigh economic ones, the assignment will be void. Certain categories of workers, such as researchers, may be considered employed to invent: in such cases, products will be assigned to the employer. Such assignments will anyway require due consideration. Only a priori obligations to assign in the employment or other contract that relate to employees in a narrow closed list, such as those employed to invent, should be upheld. These should be specific exceptions to the general rule that ownership belongs to the employee. Consideration for assigning service inventions to employer should be real and concrete, possibly a percentage such as that adopted by universities (40 per cent). If either party is unhappy with the percentage, they should have access to courts. There should be a minimal compensation to the employee that is cogent, which cannot be overridden by contact law. The inventor or creator has the right to be acknowledged as such. Authorship is not transferable. Other moral rights are considered less relevant. To the extent that they are developed from time to time, they may be transferred, but the employee can always rescind the transfer. As far as patents are concerned, the inventor has to sign forms to the effect that he is the inventor and the inventors and their details should be noted in the official record. Failure to do so may invalidate the patent. After the end of the employer–employee relationship, the employee can develop the invention. However, the previous employer is entitled to claim a reimbursement for the use of resources during the employment period. No transfers or other arrangements prior to the creation or invention will be upheld. The law is to be cogent and cannot be changed to the detriment of the employee. The original intent was to transfer all rights to the employee but, after further deliberation and discussion, a more moderate model is proposed, as outlined above, for consideration by employers, employees, legal representatives and the judiciary in Israel and elsewhere. I hope that the fact that the ‘Introduction and Overview’ is also in English implies that the book will eventually be republished in English, perhaps in a more universal rather than Israel-focused form. This will open the discussion to a wider audience. The book is a thick hardback that looks impressive on the bookshelf. As the subject matter covered comes up fairly frequently in consultations with inventors and employers, and since the law is different in different jurisdictions, I suspect I will be consulting it frequently. In Israel, it seems that it is fast becoming a core reference in this key area. I don’t know why the application form used by the Israel Patent Office does not require mentioning the name of the inventor of patent applications by companies that are not Patent Cooperation Treaty National Phase entries, but I don’t believe that forcing it to will make much difference to anyone, since virtually all employee inventions filed in Israel are also filed in the USA, where the names of the inventors are always mentioned. The information is easily accessible. As the percentage of women inventors of company inventions is more than double the number of women inventors on applications filed by the inventors themselves, the argument that companies discriminate against women inventors is untenable. The author proposes affirmative action in appointing female examiners, whilst noting that, in 2005, 18 out of 32 Israel examiners, ie 56 per cent were women. I do not see any correlation between the gender ratio of examiners and the gender ratio of inventors. I suggest that women are more attracted to becoming civil servants, such as examiners and to working for Tech Transfer Companies of Universities rather than in private IP practice, since such work has more regular hours, better job security and better social conditions, albeit lower salaries. I think this is also an attraction of university tenure. Inventing is very different from providing IP services, whether as an examiner or in private practice. The data on Israel patents which are presented in this book are nearly a decade out-of-date, but there is no attempt to see if the percentage of women inventors has changed in the interim. Nor has the author sought to determine whether the male–female divide in applications by Israelis and Israeli companies differs significantly from that in applications filed from abroad, but the country of applicant is on the form. The names of inventors in US applications are always given and readily available. This data were not examined. The theory that forcing companies to name inventors will somehow solve a problem could have been tested but wasn’t. The author does not to try to collect evidence, since it is not needed to show what she considers to be self-evident. There is no attempt to compare the percentages of women inventors in different market sectors, or to correlate this with other countries. This is a shame, as the information is readily available on the Internet, and this is essential to drawing meaningful conclusions. There are companies such as Intel Israel, with women in senior management. It might be worth looking into whether such companies show different statistics than companies managed by men. Salaries in hi-tech companies are generally higher than in other industries. Workers are regularly issued with stock options and sometimes offered 13th month salaries and other large bonuses. This can be seen as sharing the pie. In general, the raison d’être for companies is to create profit for their owners. Patent law serves an economic purpose. Companies provide inventors with bonuses and incentives to encourage creativity. They generally acknowledge the inventors unless there is a reason not to. The author has made no attempt to understand why some companies do not list the inventors’ names. If it made economic sense for companies to reward inventors more generously, then one suggests that, generally, companies would do so of their own volition. If this does not happen, there should be an attempt to analyse the underlying reasons. Publicly traded companies allow anyone with capital to invest and share the profits and risks taken by the company. The model is an economic one. IP law is an economic development. The other justifications were not significant in the historic development of IP. There is an implicit assumption that the model developed by Israeli universities would work in industry. This is not the case. Universities are non-profit organizations that are supported by public funding and academic researchers are employed to create knowledge. University employees are poorly paid compared to their industrial counterparts. However, they enjoy the benefit of tenure; they have the freedom to do what they like with their time. Promotion requires publishing papers, as per the old adage ‘publish or perish’. I consider that such papers should be owned by the educational establishment. The author has the moral right to have his name mentioned, but no more than that. I don’t think academic papers generally generate income for anyone other than publishers. Many non-scientific researchers do not have skills that are marketable outside the ivory tower. Applied scientists and engineers do. The academic model of royalty division is designed to keep highly employable scientists in academia and not industry. Industrial companies are profit-centred. They take risk in developing ideas, and will only do so if they can profit from doing so. If the inventor can take his or her invention elsewhere, and the company will simply be compensated for expenses incurred, it will not invest in research. Israel is the home of R&D facilities for many large international companies. If the local rules were different from those elsewhere in the world, these R&D facilities would fold. Without cheaper energy, materials or labour, Israeli manufacturing can only compete with products from abroad if they have first-mover advantage and patent protection. The primary reason why I advise Israeli corporate clients to file patent applications in Israel is to prevent disgruntled employees from competing with them. One invests in patent applications long before one knows if a patent will be issued and if it will have commercial value. Companies consider taking this risk as long as the patent will be theirs. Applying Dr Shlomit-Yanisky Ravid’s model would probably wipe out Israeli industry. For years, the USA considered international standardization that the rest of the world should adopt US practices. In the America Invents Act (AIA) the USA recently conformed its laws to those of the rest of the world, and now allows companies to apply for patents. The USA was big and powerful enough to do things differently for over 200 years, but one no longer has to file in the name of the inventor and then assign the application. Why should Israel adopt a system that even the USA has abandoned? Israeli economist and Nobel Prize Laureate Professor Oman recently stated that he finds socialism attractive. His only problem with it is that it doesn’t work. Half the population of the world lived under Marxist regimes. The experiment was tried and failed in Russia, and has been evolved by the Chinese into a highly capitalistic system. Israelis wanting a fairer and more equitable division of resources are invited to join one of the few remaining non-privatized kibbutzim. Dr Yanisky-Ravid’s assumption that a fairer distribution of profits between the employer and employee will increase the size of the pie is not based on any coherent logic. The current corporate patent system may not be perfect, but technology is advancing. Companies invest in new products and quality of life increases for all. © The Author(s) (2014). Published by Oxford University Press. All rights reserved.